A rubber conveyor belt more than 450ft (150m) long at a grain terminal in an Essex port has been damaged by fire. 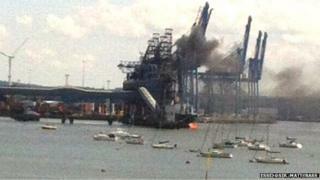 Six fire engines and two fire tugs were earlier sent to the dockside terminal at the Port of Tilbury. The incident commander with Essex County Fire and Rescue Service said 20% of the belt was found to be alight and there were no reports of injuries. "Crews in breathing apparatus tackled the fire which was extinguished by early evening," he said. A crew will remain at the scene to monitor the conveyor belt overnight.